First things first: we have an advance clip from next Sunday’s episode. It reveals that when Negan comes knocking on Alexandria’s door, he brings along a familiar friend. For bargaining? For blackmailing? No one knows yet, but there’s Daryl, looking humiliated. By all accounts the Walking Dead gravy train is still choo-chooing at full speed, but does Robert Kirkman have an endgame in mind for where he’s going? According to EW, he does. Yeah, I know exactly how it ends, and I’m always taking baby steps toward that point as I’m telling the story. I know what the end point is, and at the end of the day, I want this entire long narrative to be a complete story with a beginning, middle, and end. We’re just spending time in the middle, so, I kind of have to know what that direction is, and I have to know what the end point is to be able to keep building towards it. I think that’s the only way to keep it alive. 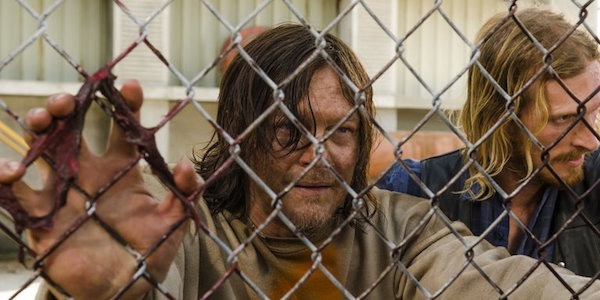 Now here’s where it gets interesting….Kirkman has admitted it is fully possible that the show could end before the comic does. One has to wonder how how long the comic will be, then, because I get the feeling AMC isn’t letting go of TWD for a long time. But Kirkman does have a plan in mind should the series end first: he’ll just let the show writers come up with their own ending. I know how I want to end The Walking Dead so I can’t tell anyone because I don’t want it on the show before I get it in my comic! So, if the show were to end ever, at any point and the comic was still going, I would have to sit down with Scott [Gimple] and pretend I have no idea how to end it and come up with another ending. Why? Because Kirkman is digsusted with George R.R. Martin’s decision to let Game of Thrones spoil future events from the books he hasn’t finished writing yet, and he never wants the same thing to happen to his own creation. Thankfully, this scenario is a long way off and there’s no telling if it’ll happen.